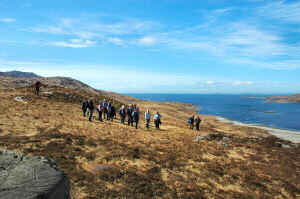 Clare Balding travels to Jura in the Western Isles to walk with Donald Euan Durrock and his teenage children. They start on the coast at Inver. In other words: On Friday the 22nd of September at 15:00hrs (UK time) you should tune your radio to BBC Radio 4 and listen to Clare Balding's Ramblings. I certainly plan to listen to it.